Most who know anything about the history of Monaco know that it was the Grimaldis of Genoa who took control of The Rock during the long feud between the Guelf and Ghibelline factions that raged throughout Italy between the adherents of the Pope and the (German) Holy Roman Emperor. But how was it that the aristocratic Italian Republic of Genoa ever came to have any interest in Monaco? 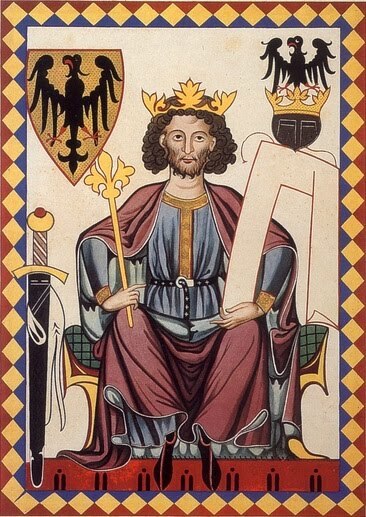 Well, that was all thanks to the man seen above; the Holy Roman Emperor Henry VI. He was born in Nijmegen (in what is now the Netherlands) in 1165 and was the son and heir of the famous German Emperor Frederick Barbarossa. In his turn Henry VI became King of the Romans, Holy Roman Emperor and King of Sicily. In the English-speaking world Emperor Henry VI is famous for ransoming King Richard the Lion Heart of England for 150,000 pieces of silver. However, in middle and southern Europe he was "the man" and particularly after he became the King of Sicily he was the most powerful monarch in the Mediterranean area, dominating the region and even recieving tribute from the Byzantines. One small, often overlooked, part of his vast realm was the port of Monaco which was being ravaged by raiding Lombards and repeated attacks by Barbary pirates. It was the rampant piracy that began to be felt by Emperor Henry VI and so, to put a stop to it, he turned to the skillful seafarers of the Republic of Genoa. In 1191 the Emperor agreed to cede the port of Monaco to Genoa (at the time simply the harbor and The Rock) if the Genoese would build a castle on The Rock to be a base against pirate attacks. Evidently Genoa was not too concerned with this business deal as it took them all of twenty-four years to act on the bargain and build their fortress; finally recognizing that Monaco was very well placed between Genoa and Marseilles to be a lucrative port in their little merchant empire. So, the castle was finally built and Monaco came within the Genoese sphere of influence and it was that same castle which was famously captured, in a suprise attack, by Francesco Grimaldi on the night of January 8, 1297. So, the long history of the Grimaldi dynasty in Monaco all goes back to that one night when the castle was stormed, a castle built by the forces of Genoa that was first given to them in a bid to stop piracy by Emperor Henry VI in 1191.